Free rewards for your spending. What’s that saying again? The best things in life are free? When it comes to credit cards, we tend to think of premium cards as being the best ‒ and willingly open our wallets to pay the hefty annual fees. Why? Because cards with annual fees tend to offer more perks, higher earn rates, and a better feeling of comfort and convenience. But that’s not always the case. Sometimes, paying that annual fee just doesn’t outweigh what you get in return. And that’s where a no annual fee cash back card comes into play. Rather than paying for an expensive card that your spending habits don’t let you get the most out of, a no fee cash back card can be the right solution. So when should you think about getting a no fee cash back card? even the ability to withdraw your earned cash from an ATM. Best of all, you can generally redeem as often as you like ‒ usually once you have $20 to $25 in your cash back bank (some issuers even let you redeem any amount you want). There’s less waiting for your points bank to build up so you can redeem for a large reward. This way, you can still get some great features, but without the cost of an annual fee. So, what are the downsides? Well, if you travel a lot, the insurance coverage won’t be nearly as robust as a premium card. Also, if you travel frequently with one airline, getting their card helps save on things like baggage and can give you companion fares to reduce the cost of flying. Plus, if you spend a lot on your card, you’ll end up earning more rewards with a premium card. These rewards could then pay for the annual fee – and much more. And while foreign exchange fees are sometimes waived on no fee cash back cards, this perk is much more prevalent among premium and travel credit cards. This can be important if you travel or shop online with currencies that are not in American dollars. 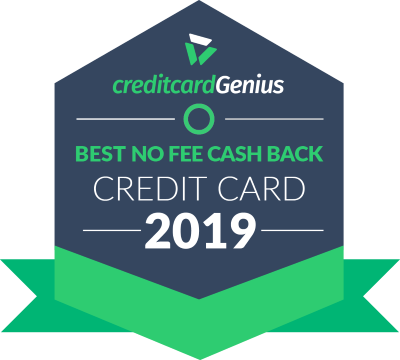 So here’s our top best no fee cash back cards available on the market today, which we'll update when cards change or new cards come into the market ‒ so you'll always have the most up-to-date list.